Some would say that the tie has no sartorial interest, however this accessory is a must in a man's attire. It is in the twentieth century that the tie is essential in the habits of elegant people. In my opinion, it has the functionality to hide shirt buttons as well as showcasing clothing. Nowadays, men who wear ties are true anti-conformists; it makes us different, intriguing, powerful. Faced with a refined tie and well worn, we can only be respectful and admiring to the person who wears it. The real rebel is the person who wears a tie or a bow tie with an elegant pocket square. During the 80's, the Friday wear has made its appearance. This trend, coming from the United States and instilled by some big banks and companies, was to allow senior executives not to wear ties the day before the weekend. This fashionable effect became widespread and brought our society into a kind of sad and ordinary world. For this reason, I believe that the tie plays a preponderant role in our society. Welcome to the club, this very closed club, of those who love beauty and style. The tie assembly: they are composed of a padding fabric (interlining) to give volume and enfold by a stuff to dress the tie. I generally use this typology for the assembly of 3-folds ties. 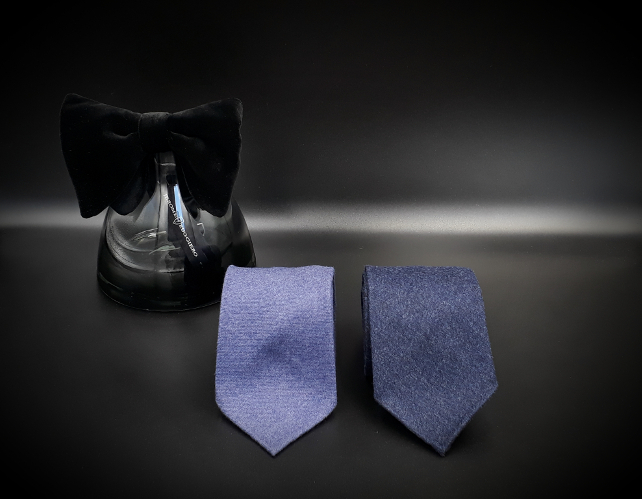 Folded ties: this process consists in folding the fabric several times to give the necessary volume to the tie, it is generally without interlining. I use this typology for the 7 folds ties but also for the famous 9 folds ties, and more rarely, the bespoke 12 folds neckties.